Age 78, of Lucasville, passed away Wednesday, November 7, 2018 at SOMC Hospice in Portsmouth. She was born July 21, 1940 in Portsmouth to Carl and Alice (Conkel) Middaugh. 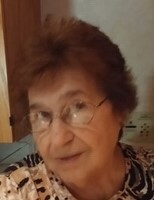 Rena enjoyed crosswords, jigsaw puzzles, watching reruns of her favorite show, MASH, and watching NASCAR, especially when her favorite driver, Dale Earnhardt, Jr. was competing. Rena was a longtime member of Minford Nazarene Church. More than anything else, she enjoyed spending time with her family, especially her beloved grandchildren. She is survived by three sons, David “Eddie” (Beth) Lockhart of OK, Michael Lockhart of New Boston, Steven (Kim) Lockhart of Portsmouth; one daughter, Rena (Tim) Miller of Lucasville; five grandchildren, Melissa Feazell of Wheelersburg, Hollianna (Bobby) Brewer of Piketon, Kristin Lockhart of Portsmouth, Gabriel and Ryan Miller of Lucasville; eight great-grandchildren, Nathan, Zachary, Alex, Robert, Brianna, Helena, Raven, and Rowena. In addition to her parents, she was preceded in death by her husband, Raymond Carden and one brother, Randall Middaugh. Funeral services will be held at 11:00 a.m. on Saturday, November 10, 2018 at WOLFE-NELSON FUNERAL HOME in Sciotoville with Pastor Mark Bales officiating. Interment will follow at Squire Cemetery in Muletown. Friends may call Friday from 5 – 8 p.m. and one hour prior to the service on Saturday. Fond remembrances and expressions of sympathy may be shared at www.WolfeNelsonFuneralHome.com.